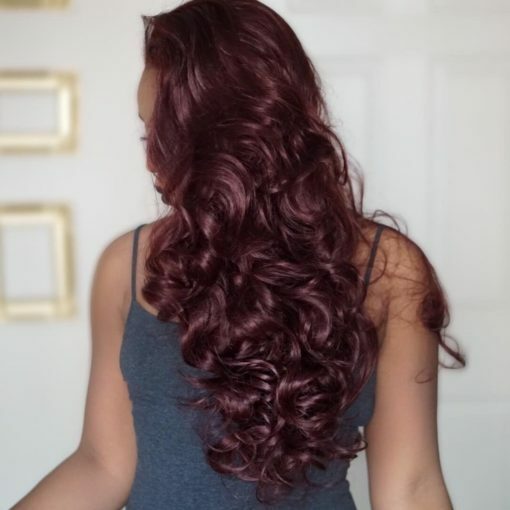 Deep, rich burgundy red curls fall past the bust, and the realistic Lace crown has plenty of volume in the front lifting it from the head and giving this style plenty of movement. Lovely wig!! Lots of compliments on it, also despite its length it’s very light to wear and easily style! Definitely recommend! 1 out of 5	DO NOT BUY! How it is displayed and showed to you on youtube videos (which by the way, looked lovely on the ladies I’ve seen model it) is not the exact same wig in my opinion. I ordered mine like 2 weeks ago, and just recently received mine. The wig came with bangs and the pattern that is shown in the youtube video, which is like a body wave, wasn’t even a body wave. The packaging was terrible as well. I DO NOT recommend. It’s a waste of $70. Hi there, sorry to hear you were unhappy with Spiced Apple. I can 100% guarantee that it is the same wig as any models or previous customers would have modelled. Perhaps in the video you reference the person has styled the wig differently. This is very common. We have had no contact from you previously until this review. We are open and honest and dropping our customer support an email would have helped you out. I absolutely love the wig. The only thing is dat de hair piece in the front keeps getting in my face… not really a way to let it stay out of my face. But the rest of the wig is soft and beautiful! This is an absolutely gorgeous wig. Gorgeous colour, lovely and thick, doesn’t tangle and looks absolutely amazing when eating it. Great long lace front so can be parted anyway. It is an amazing wig.